I went to Freiburg with my girls from home in 2009 when two of them lived there. We all met on a nice and warm late summer weekend and did a bit of sightseeing before we ended up at chatting the day away. 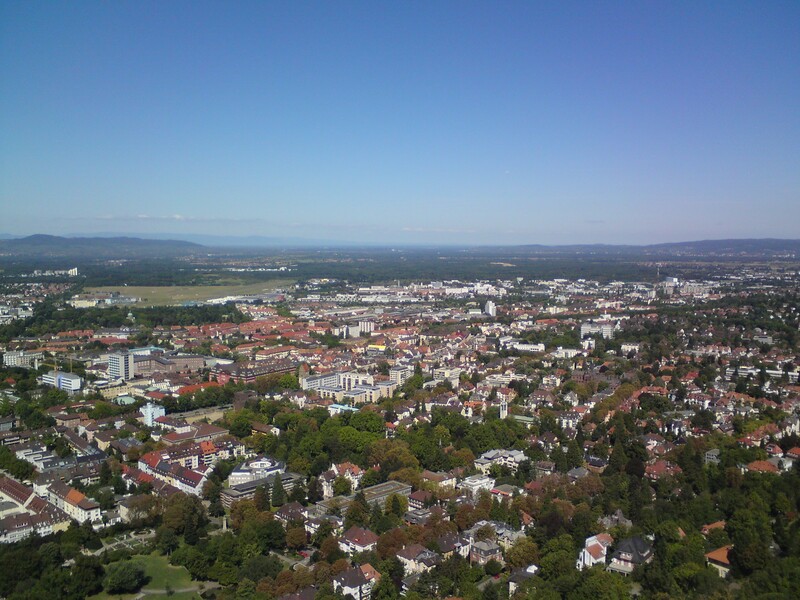 Freiburg is one of those old cities in Germany (founded about 900 years ago) It is as well known for its old city center, its university but also for being quite a ecologocial town with special sustainable neighbourhoods like the Vauban. It is situated on th south western edge of Germany, very close to France and Switzerland. And it is really beautiful there. You have the old narrow cobbled streets and magnificent building such as the cathedral or the old Merchants hall. Just let youself get lost within the city center and enjoy the beauty of medieval streets. If you are hungry why not opt for a “Flammkuchen”, a Tarte flambée, quite popular here in the region? We had one in the city center. I am not really sure, but I think it could have been in the Franziskaner Keller. But any place that offers a place to sit outside in the sun in summer should be fine. After a stroll along the Dreisam river we went up the Schlossberg, Freiburg’s mountain. It has a view tower. But the tower is so thin and fragil that I did try to climb it but, being a bit afraid of heights or rather being afraid of being on seemingly not too really stable constructions in high heights with a combination of not really enjoying climbing up or even worse climbing down stairs in high buildings, my fun was limited. I always try to climb such things because I like the view. I would just feel better on a) a solid building (e.g. a church tower would do) that has b) a lift so that I don’t have to climb stairs. The view was great though. The say that on good days you can even seen as far as France. 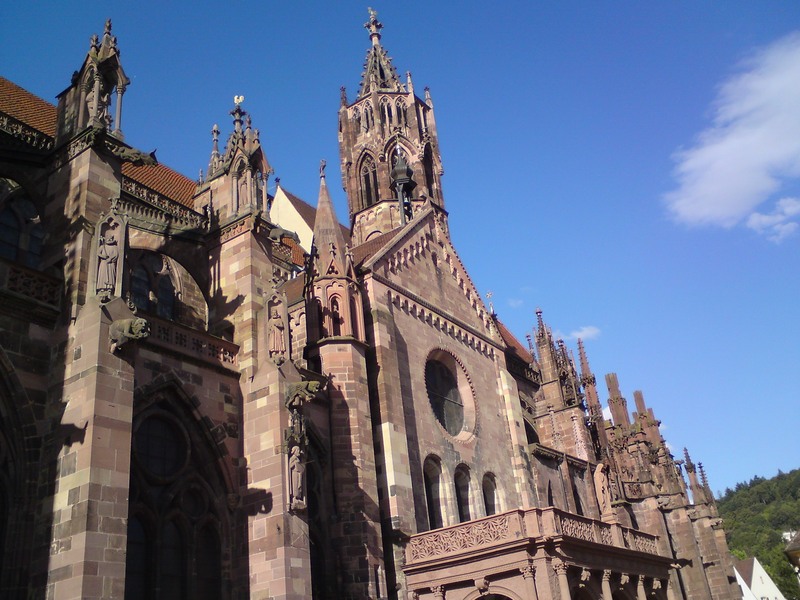 After all, Freiburg is a really nice city that you can explore in a day or two. And with it being the warmest city in Germany you also have a chance on good weather. Just don’t go there for the christmas market as it is not suppossed to be very good. 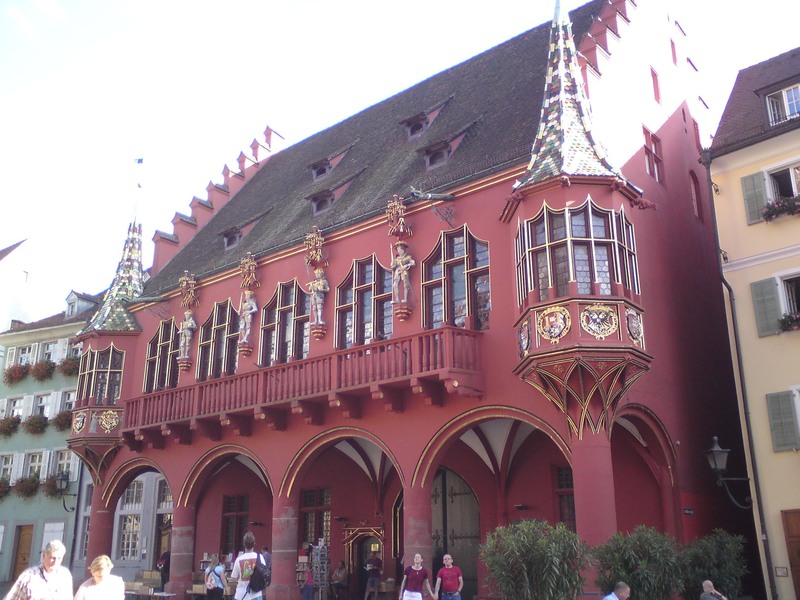 This entry was posted in Germany and tagged Freiburg, Short Trip by kathatravelling. Bookmark the permalink. Aw, I love Freiburg. Spent half of my childhood vacation in that region. So beautiful!